Some of you may have heard bits and pieces of this, but haven’t gotten the full extent of my frustration and despair as I was trying to keep it a surprise from my family. Yesterday was the first Thanksgiving and major holiday my family has celebrated without my grandma, who died earlier this year. Now, in my family, Thanksgiving is THE holiday. Growing up, Grandma and Papa made everything, from the salad to the desserts (special requests from nearly every member included,) and provided a feast of what can only be called magical proportions. Everything homemade, stuffing with real breadcrumbs, seven layer salad, piles and piles of mashed potatoes, sweet potatoes, cranberry sauce, cornbread, green beans made with bacon fat, corn (both creamed and kerneled variety) banana pudding, and coconut cake. With real coconut. Many a year I have eaten myself into a near catatonic state and found myself stretched out on the couch, not due to turkey coma but because I could only breathe if I was horizontal. It was just that good. So last year, we had a pretty good idea that this might be our last Thanksgiving with Grandma, and myself, mother, sister, two cousins and second cousin, and my aunt really tried to do everything the way she did. The pressure was insane, and the phrase “almost as good as Grandma’s” abounded all day. It took SEVEN of us, through furious emails and threatening phone calls, to *almost* get it right. How in the world this woman did all of this by herself while working full time is beyond me. So, this year had a little bittersweet touch to it. Not only is Grandma gone, but we are all split across the country for the first time I can remember. We’ll be at my sister’s for the first time, possibly starting our own little tradition. I’m in charge of peach cobbler every year, every holiday. 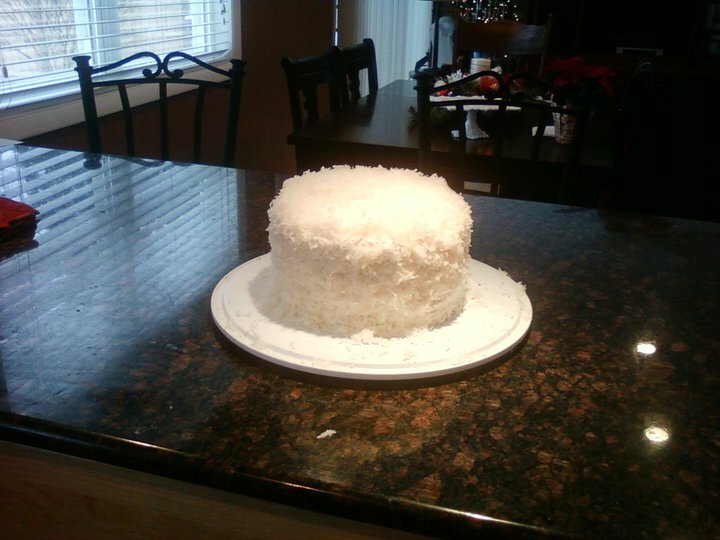 My mother in law, Sharon, had the idea that I should try and make Grandma’s coconut cake, never attempted completely from her recipe, mainly because it starts with “poke holes in the eyes of the coconut,” has the words, “grind coconut with a meat grinder,” and is a full page long. Cake and frosting from scratch. But I agreed that it would be a nice suprise on the first year without her. So Sharon, cause she’s awesome like that, went out and bought all new cake pans and ingredients, an “easy open” coconut, cake leveler, and an insane amount of butter and sugar and offered to do a trial run with me, as the only thing I’ve ever baked is that freaking peach cobbler. Thus begins the nine hour process of making coconut cake. Now is as good a time as any to mention that I dislike coconut immensely and have only tasted this cake once, and that was only because my aunt Sheila told the story of how she snuck down one Thanksgiving night and ate an entire half of it so she wouldn’t have to share with her daughters in the morning. That’s how good this cake apparently is. Scene: Saturday late morning at my in-laws. Tony and I have been to a surprise party for one of his friends the night before and slept on a couch attached to a bait shop. Tequila was involved. We had went to bed around four and got up and drove directly to Sharon and Bob’s. We? Feel AWESOME. We begin by trying to open the coconut, involving my father in law with a hammer in the kitchen, drain the milk and shred it up. This takes approximately forty minutes. Next, cake. Painstakingly measure ingredients into bowl the size of China, mixing, rereading, mixing, and a little swearing. Use sifter to sift flour, baking powder, sugar, and salt. Recipe says to sift four times. One time takes 25 minutes. Abandon this part of Grandma’s recipe. Pour into four cake pans (Oh, yeah, didn’t I mention it’s a FOUR LAYER CAKE?) and set to bake. Break for pizza. Burn tongue. 7 minute frosting is a bitter, bitter lie. Spend forty minutes hunched over double boiler with hand mixer. “Are those peaks?” “I don’t know, what do peaks look like?” “Hmm, are THOSE peaks?” Study more intently, even though I don’t know what I’m looking for. “It’s doing something.” “Not peaking.” Sharon leans too close and steams up her glasses. Pause for me laughing. Eventually evil frosting has multiplied enough to sort of look like frosting and appears to be “spreading consistency.” Only it’s kind of hard. And not very pliable. Begin process of “stacking cakes.” Cakes are all stuck to brand new pans, despite explicitly following instructions to wash new pans with soapy water and greasing the pans. Spend fifteen minutes shaking them upside down and hitting the bottom before very gently coaxing them out with a knife and spatula. It’s now three thirty. I am fading and but FAST. Cake is supposed to sit for 12 hours. Plan is for Tony to try tomorrow as he likes coconut and knows what the cake is supposed to taste like. Go home and watch the Bears get walloped. Monday evening: Me, “Are you ready to try the cake?!? !” Super excited. We carefully open the airtight container, cutting off a small piece. I stand in breathless anticipation, watching him take a bite. “Yeah, something’s WRONG. Very wrong. This is not good.” NOOOOOOOO!!!!!! “What do you mean? It just doesn’t taste good?” “No. Like it’s WRONG. Bad. Bad coconut? It’s way off.” Let loose string of expletives and call Sharon in a panic. She calmly reassures me, reminding me of all the things we figured we may have done wrong. I’m sure she regrets her very nice gesture by this point. Go to Jewel like an idiot Wednesday at five. Search for coconut milk for 30 minutes and nearly tackle and dismember elderly Russian woman who cuts in front of me with a full cart of vegetables, 90% percent of which the cashier has apparently never seen. “Is this kale or parsley?” “Is this a jalapeno or habanero?” HATE. Realize, too late, my bowl is not the size of China but is instead normal, everyday big bowl. Ingredients are rapidly rising to top of bowl and the mixer is sending chunks of butter, flour, and cake mix EVERYWHERE. Including my beer, the microwave, the cats, my hair, the stove, and possibly the television in the next room. Also realize too late my kitchen is half the size of Sharon’s and I have no nifty little racks to cool cakes on. Balance them precariously on counter island to cool. Throw previously much loved and missing cat across the apartment in a fit of rage when he jumps on island to see what the crazy woman is staring at. Take break for calming cigarette and open new beer. In a search for measuring spoons, find handy egg white separator. I have no idea why I have this. I think it’s probably from when we were registering for our wedding and gave Tony the zapper thing. This is also why I have three garlic graters and a solid crystal rooster. Only know what it is due to there being a picture of an egg on it. Begin evil frosting. Yell in frustration to heaven at Grandma “Why didn’t you ever tell me what peaks look like!!! !” Call my sister in law, Mary, while mixing over double boiler. “CAN YOU HEAR ME? WHAT DO PEAKS LOOK LIKE?” “Mountains!” We discuss while I somehow balance phone, mixer, and Miller Lite. Eureka! Peaks! Hang up on Mary and remove frosting from double boiler. Begin stacking cakes. Still sticking a bit, but not with the stubbornness from Saturday. Frost each layer as I go, spreading bagged coconut as I go with no less precision than a surgeon. This? This is starting to look like Grandma’s cake. Cake is still nearly a foot tall, but actually looks like a cake! Woo-hoo! Put cake in fridge and say quick prayer to Grandma to somehow make it edible. Haphazardly make peach cobbler. Stay up drinking too late. We took a picture of me next to it, just like Grandma used to do. And it was good. Everyone liked it. We got it right. And my aunt in South Carolina called to see how it came out, and my mother in law couldn’t wait to hear how it went over. And I was reminded of how lucky Tony and I are to have such a collective amazing family, and that we are loved. It was a great Thanksgiving. Carly’s table and china was beautiful, and in the tradition of Grandma, we took a picture of her table. There was the moment when the turkey fell off the rack in the oven, but that just added to the memories. (Because the mental image of my mother yelling “Oh, no!” and me and Carly subsequently laughing ourselves silly and the look of relief on Bob’s face when he caught it will never, ever be replaced.) Us, my parents, Carly and Bob, and Bob’s parents ate, drank and laughed. And that’s how Grandma was still with us. Totally worth every second.